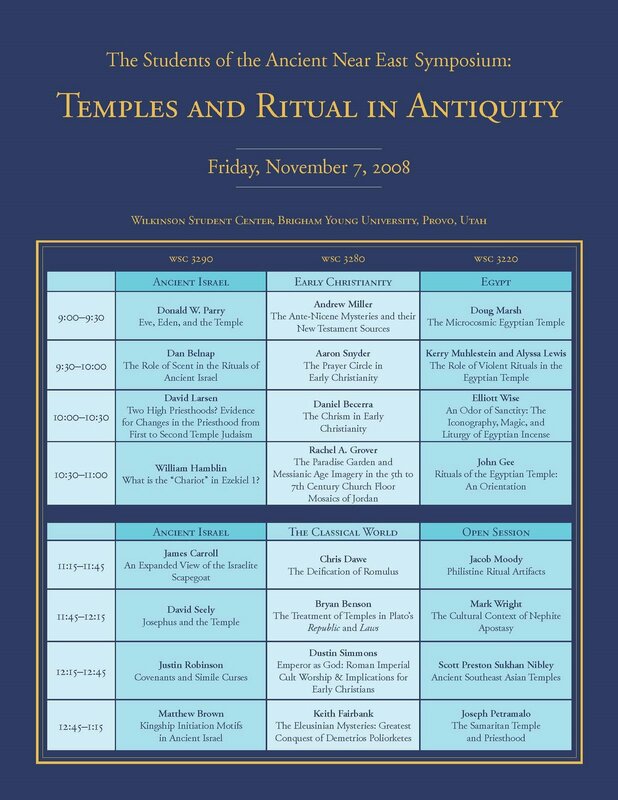 The Students of the Ancient Near East (SANE) is holding a symposium on November 7th, 2008, that will be discussing Temples and Ritual in Antiquity. Many speakers are lined up (including but not limited to William J. Hamblin, John Gee, Mark Allen Wright, Matthew Brown and David Seely) and presentations on Israelite, Christian, Egyptian, Mesoamerican and Classical topics will be delivered. It is going to be held in the BYU Wilkinson Student Center and admission is free. Those who are in the area are encouraged to attend. A schedule has been posted above. For more information, see here.